The Open Access version of this book, available at https://www.taylorfrancis.com/books/9781138125124, has been made available under a Creative Commons Attribution-Non Commercial-No Derivatives 4.0 license. This volume addresses a crucial, yet largely unaddressed dimension of minority language standardization, namely how social actors engage with, support, negotiate, resist and even reject such processes. The focus is on social actors rather than language as a means for analysing the complexity and tensions inherent in contemporary standardization processes. 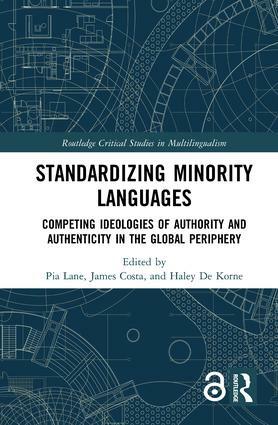 By considering the perspectives and actions of people who participate in or are affected by minority language politics, the contributors aim to provide a comparative and nuanced analysis of the complexity and tensions inherent in minority language standardisation processes. Echoing Fasold (1984), this involves a shift in focus from a sociolinguistics of language to a sociolinguistics of people. The book addresses tensions that are born of the renewed or continued need to standardize ‘language’ in the early 21st century across the world. It proposes to go beyond the traditional macro/micro dichotomy by foregrounding the role of actors as they position themselves as users of standard forms of language, oral or written, across sociolinguistic scales. Language policy processes can be seen as practices and ideologies in action and this volume therefore investigates how social actors in a wide range of geographical settings embrace, contribute to, resist and also reject (aspects of) minority language standardization. Introduction: Standardising Minority Languages: Reinventing peripheral languages in the 21st century? James Costa, previously a postdoctoral fellow at the University of Oslo, where he worked on the standardization of Scots as part of the STANDARDS project directed by Pia Lane, is currently a lecturer at Université de la Sorbonne Nouvelle in Paris, where he teaches sociolinguistics, linguistic anthropology and semiotics. He is also an affiliate of Lacito, a CNRS, Sorbonne Nouvelle and Inalco research unit. His current research seeks to understand how a nationalist, post-referendum public space is being constructed in Scotland, and how the standardization of the vernacular (Scots), or its rejection, has effects on who gets to be included or not in the public debate. He is the author of a monograph based on previous work on language revitalization in Provence, Revitalising language in Provence (2017). Haley De Korne conducts research and advocacy in relation to minoritized language communities, multilingual education, and language politics. She has participated in Indigenous language education projects in a variety of contexts, in particular in Oaxaca, Mexico, and is currently a post-doctoral fellow at the Center for Multilingualism in Society across the Lifespan at the University of Oslo.